Bake bacon on a slotted pan or metal rack set on a rimmed baking sheet to very crisp. Cut slices into thirds. Place avocado in a food processor and add lemon or lime juice, vinegar, olive oil, Tabasco, sour cream or yogurt, garlic, herbs, salt and pepper. Pulse into a dressing and transfer to a serving bowl. 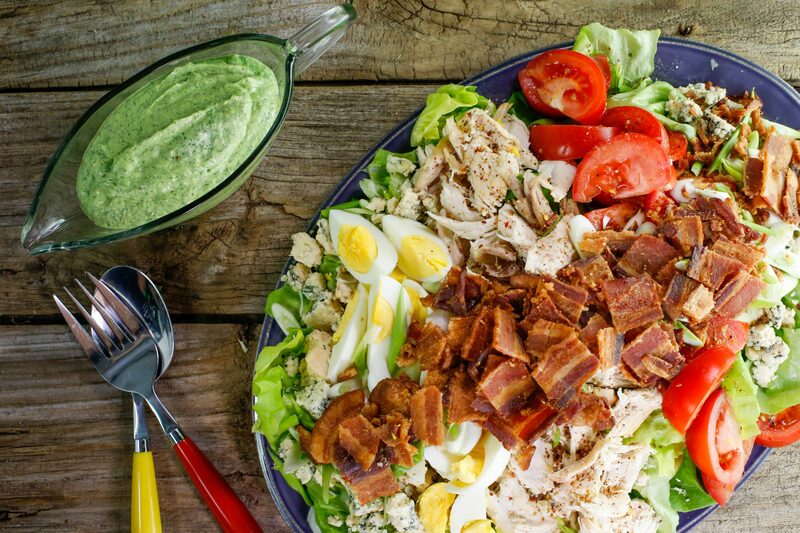 Arrange lettuce on a large serving platter and top the lettuce with onions, tomatoes, eggs, chicken, blue cheese and bacon. Working in any arrangement you like, set stripes of each ingredient or place them in a scattered pattern. Serve dressing alongside. In Recipes-list.com we have selected the most viewed recipes from category - uncategorized . Enjoy the best recipes specially selected for you! Rotisserie Chicken Cobb Salad with Avocado Ranch Dressing is the right choice that will satisfy all your claims.